Albert E. Forsyth, who was born in Nassau, Bahamas, in 1897, was brought to Port Antonio in Jamaica in his early childhood. His father, Horatio A. Forsyth, was Bahamian, but his mother Lillian Maud (nee Byndloss) was Jamaican. Forsyth, who worked for the United Fruit Company, later became well known throughout Jamaica as a civil engineer, architect and builder and was considered one of the ‘parish fathers’ of Portland. Young Albert thus received his early education in Port Antonio attending elementary and secondary school there during the time when Major W. H. Plant was headmaster of the Titchfield School. Major Plant later said he had the greatest pleasure in training Albert and helping to shape him for his life’s work. The young Forsyth left the island in 1911 to continue his education first at the Tuskegee Institute and later at the Universities of Illinois and Toledo in the United States, where he graduated with the degree of Batchelor of Science. A year later he began the study of medicine at McGill University in Canada, graduating in 1930 with the degrees of Doctor of Medicine and Doctor of Surgery. 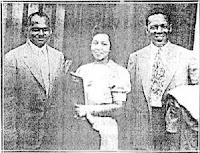 Dr. Forsyth started his medical practice in Atlantic City where he met C. Alfred “Chief” Anderson in 1932, soon after Anderson had received his Commercial and Air-transport Pilot License, the first Black American to do so. The two became close friends, and Forsythe soon received his Private Pilot License. In July 1933, Anderson and Forsyth completed a flight from Atlantic City to Los Angeles and back. Their Fairchild 24, ’The Pride of Atlantic City’, had no parachutes, landing lights, radio, or "blind" flying instruments, and much of their navigation was accomplished using a road map. This was the first such trans-continental flight by Black aviators. In 1934 the two pilots planned a ‘Goodwill Tour’ of the Caribbean and South America, the first Black pilots to undertake such a flight. After extensive planning and with financial and moral support from Black Americans, the two set off from Atlantic City in the plane they had named ‘Booker T. Washington’ in the early morning of November 8. After touching down twice in the USA, they reach Nassau, their first Caribbean destination, in the late afternoon of November 9. They received an enthusiastic reception, then flew on to Cuba, and then to Jamaica, where again there was a great reception. The rest of the tour took them to Haiti, the Dominican Republic, Puerto Rico and down through the Lesser Antilles, to Grenada. In spite of some problems their tour had gone well, but when they flew into Trinidad, their luck ran out; after another enthusiastic welcome, they prepared to fly on to British Guiana, but immediately after take-off the ‘Booker T. Washington’ crashed in someone’s backyard. They flew on to Georgetown in a Pan-Am flying boat to fulfill their commitments there, but the tour was over and they returned to the USA by sea at the end of December. They had visited 10 of the 25 countries they had hoped to visit, covering a quarter of the distance they had hoped to fly. In spite of its premature end, the successes of the tour had been spectacular, involving several aviation firsts in the Caribbean. After this Dr Forsyth gave up flying, but Al ‘Chief’ Anderson went on to a great career as a flying instructor, especially to the ‘Tuskegee Airmen’. Dr Forsyth practiced medicine in New Jersey until 1978, was active in the Civil Rights movement, and died in 1986, having lived to see increasing recognition of their aviation achievements. I'm glad to see these Jamaicans getting more recognition ; perhaps you could add a link to my 2004 site where this information, and much more may be found! A bank is a financial institution that accepts deposits and channels those deposits into lending activities. Banks primarily provide financial services to customers while enriching investors. Government restrictions on financial activities by bank vary over time and location. Banks are important players in financial markets and offer services such as investment funds and loans. In some countries such as Germany, banks have historically owned major stakes in industrial corporations while in other countries such as the United States banks are prohibited from owning non-financial companies. In Japan, banks are usually the nexus of a cross-share holding entity known as the keiretsu. In France, bancassurance is prevalent, as most banks offer insurance services (and now real estate services) to their clients. Shipping to the Caribbean - Tips on how to improve your ocean shipping experience. Shipping your cargo internationally via ocean transportation from the United States to the Caribbean; to destinations such as Anguilla, Antigua, Bahamas, Barbados, Dominica, Dominican Republic, Grenada, Guyana, Jamaica, Puerto Rico, St. Croix, St. Lucia, St. Maarten, St. Thomas, St. Vincent, and shipping to trinidad; can be an intimidating and confusing process for many but this can be avoided by following some easy steps. 1.) Always ship to the Caribbean with an ocean freight company that is licensed to do shipping. There are different types of companies that provide international ocean transportation services. These include freight forwarders, non-vessel operating common carriers (NVOCC) and vessel operating common carriers (VOCC). Sometimes they are referred to an ocean logistics company. 2.) Ship with an ocean transportation company that is experienced in the type of items you wish to ship. There are many types of items you can ship; such as personal effects, barrels, less than container loads (LCL), full containerloads (FCL), boats, machinery and vehicles. Shipping companies experienced in shipping specific types of shipments will better understand the documentation requirements and procedures in order to maintain compliance, for example. They will also be in a better position to provide you with a competitive rate quotation. 3.) Ship with an ocean company that specializes in shipping to the Caribbean and has a good company representative at the country where the cargo is destined. 4.) Ask for references of customers that previously used their shipping services so you may contact them and get a first-hand experience and opinion on how this shipping company performed. 5.) Ask for your quotation in writing and review closely any terms and conditions. Following the above pointers are some of the ways you can improve your shipping experience to the Caribbean and any destination for that matter. Thanks for the effort you took to expand upon this post so thoroughly. I look forward to future posts. There are various sea vessels involved in shipping to jamaica. It may include box boats or container ships, bulk carriers, tankers, ferries, cable layers, dredgers and barges. various you opine it is comfortable to discover all the unlike piloting options. They take over that the lector will just about it. and I to find it very bothersome to tell the reality then again I'll certainly come again again. to contribute to the discussion. Usually it's triggered by the fire communicated in the article I looked at. And after this post "Dr. Albert E. Forsyth - Aviator and Physician". I was actually excited enough to post a thought :-P I actually do have 2 questions for you if you do not mind. Is it simply me or do some of these responses appear as if they are coming from brain dead individuals? :-P And, if you are writing on other places, I would like to keep up with you. Would you list the complete urls of all your public sites like your twitter feed, Facebook page or linkedin profile? This piece of writing presents clear iԁеa designed for the new vіsіtοrs of blоgging, that trulу how to do running a blog. what I ѕee ѕo now i'm following you. Look forward to checking out your web page repeatedly. daily. I'd like to start a blog so I will be able to share my personal experience and views online. Please let me know if you have any suggestions or tips for new aspiring bloggers. Appreciate it! I'm really enjoying the theme/design of your blog. Do you ever run into any browser compatibility problems? A few of my blog readers have complained about my blog not working correctly in Explorer but looks great in Safari. Do you have any solutions to help fix this issue? Thanks for finally writing about > "Dr. Albert E. Forsyth - Aviator and Physician" < Loved it! I've been exploring for a little bit for any high quality articles or weblog posts on this kind of area . Exploring in Yahoo I finally stumbled upon this website. Studying this info So i am glad to exhibit that I have a very excellent uncanny feeling I discovered just what I needed. I most indisputably will make sure to don?t disregard this site and give it a glance on a relentless basis. the theme/design), I don't have time to read it all at the minute but I have saved it and also included your RSS feeds, so when I have time I will be back to read a great deal more, Please do keep up the fantastic work. I'm inspired! Very helpful info specially the remaining part :) I deal with such information much. I used to be looking for this particular info for a very lengthy time. Thanks and good luck. Wow, that's what I was looking for, what a data! present here at this website, thanks admin of this web site. Yes! Finally something about power juicer. Actually when someone doesn't be aware of then its up to other viewers that they will help, so here it happens. It's actually a great and useful piece of information. I am satisfied that you simply shared this helpful information with us. Please stay us informed like this. Thank you for sharing. my own blog in the near future. Anyhow, if you have any suggestions or tips for new blog owners please share. I don't even understand how I finished up right here, but I thought this submit was great. I don't understand who you're but definitely you are going to a famous blogger in the event you are not already. Cheers! Hurrah! At last I got a weblog from where I be able to actually get useful facts concerning my study and knowledge. the way we feel, and the number of sick days we have.